Guys. Sorry I have been unusually silent lately. I honestly tried to write 2 different posts last week and just couldn’t. I’m in a funk. One of my posts that I did post I ended up editing out a ton, which I have rarely, if ever done before. Of course it has to do with Rio, but I am also not ready to talk about it. Partially because I don’t have all the answers yet, and partially because I just don’t know what to say. When I feel like I can’t be honest on here I get MAJOR writers block and simply cannot write at all. This blogging thing can be hard, because you are also aware that people could read what you write and judge you and your decisions, or misinterpret your intentions. I promise to talk all about it when I can, but for now we are going to just talk about my last 2 lessons from the past week/weekend because this not posting thing is killing me slowly. I had a lesson last Thursday (with one other rider) and a private lesson on Sunday. I am really enjoying the smaller lessons, especially as we are legging Rio back up. They allow for a ton more one on one instruction and open dialogue with my trainer, which has been exceedingly helpful. Before Rio did his little escape trick and got banged up, I had been trying to schedule some private lessons to discuss some things I had on my mind, so this has been the perfect opportunity to take things back a few steps and proceed with clarity. For example, I was feeling really disconnected in my flat work in our larger group lessons (4-5 riders). We would all work on the rail, like in a flat class, and I would get the occasional comment/correction as we went through the exercises. This was fine when everything was going well, but when it wasn’t all perfect (and let’s be real, when is it ever all perfect? ), I would sometimes feel frustrated/unsure of what was going wrong or how to best fix it. 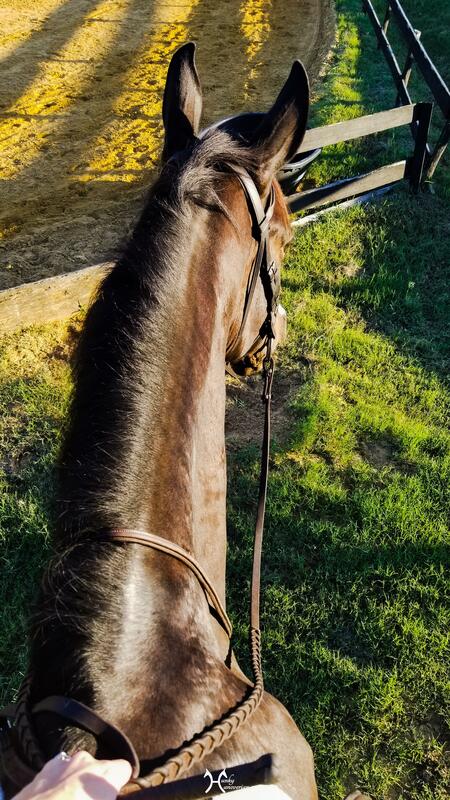 The jumping section of group lessons is of course done one at a time with trainer’s undivided attention, but it’s hard to go into jumping if you feel stuck on some part of your flat work, or like something just isn’t clicking. When that happens, I feel like it always carriers over into my jumping. Receiving more attention throughout my entire lesson has been enlightening. Rio is really feeling like he is reaching a new level of broke at times, but that also means I need to ride him at that level. In particular, I struggle with doing TOO MUCH. I need to quiet and refine my aids, and give him more opportunities to do the work himself, which goes hand in hand with letting him make mistakes too. 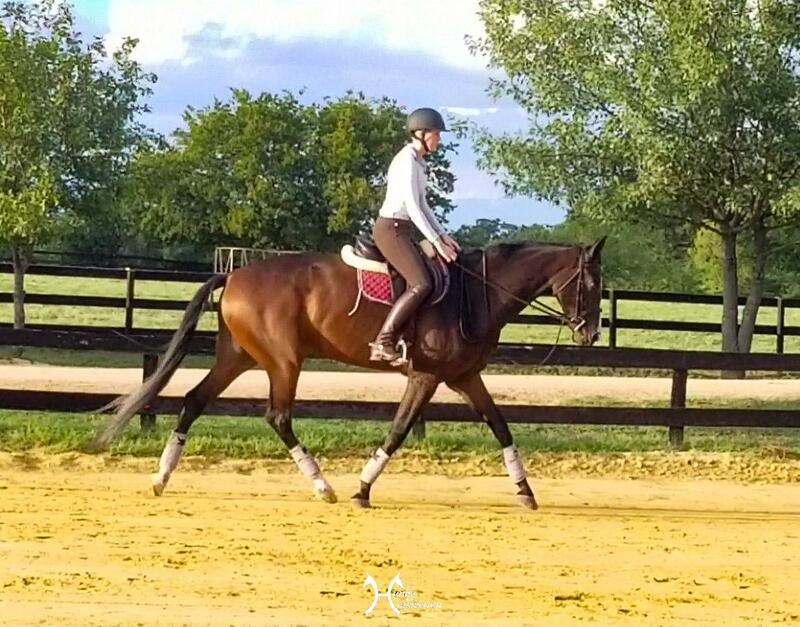 During our trot flat work we have been focusing on starting with no rein contact at all, and focusing on getting him moving well behind and with energy before taking any sort of feel. Once his little motor gets going, we switch our focus to lightening his front end, which has to be done in increments. I take a light feel, support with my leg, and straighten my hip angle, more upright ah la a dressage rider. Rio has been responding really well, by shifting his balance more to his haunches and lightening the forehand. Then I give away the contact and allow Rio the opportunity to carry that balance on his own. It has been going exceedingly well! As long as I am very clear with my aids, he responds perfectly. The canter is coming along as well. We also start it be sending him more forward, and making sure to establish a quality 3 beat gait before starting to put him together, otherwise he tries to tranter. Where his trot work is an A, his canter is a C- at the moment. Not saying he isn’t trying, just that we have a lot farther to go. We did have a lot of success implementing some counter bend to encourage straightness, and then he would have a lovely engaged canter, but he can only truly hold that quality for 6-7 strides at the moment. Our C canter has shining A moments, but then it fades again. We have slowly brought him back into jumping in my last 3 lessons, and the most recent one on Sunday was almost back to the level of a normal jump lesson in number of efforts/length of course. He is listening well and putting in excellent efforts. Best part- when we make a small mistake, such as when I’m not patient and decide to ask for the long spot, he easily puts in the add the next time around and doesn’t anticipate the flyer like the time before. And when he gets a bit flat in the line and has a rougher out, he naturally sets himself back a bit the next time through. Talk about an ammy friendly boy! He is really starting to figure out the jumps with little input from me, which is amazing because I’m not always to be trusted. I have back to back lessons this coming weekend with Trainer Stacie and i am very excited to see how it goes! We currently are planing on a show in mid October, only 3 weeks away! Fingers crossed we get back to show ring ready soon and are ready to compete. glad things are going well with Rio under saddle. i feel ya on hating not being able to share everything online but… ya know… not everything needs to be shared if you don’t wanna or don’t feel like putting yourself out there like that. we’ll never be the wiser for it haha. hope everything is ok tho! Sending you hugs, hope the funk clears! You guys look great in that trot photo, moving out nicely. My trainer has me do a lot of counterbending at the canter too. Sorry you’re going through some stuff. I hope the good lessons you’re having help a little! Hope things work out for you! Thank you Stacie! Fellow blogger support means so much! Also, those towels are fantastic. Thank you!! I appreciate the support from fellow bloggers so much! 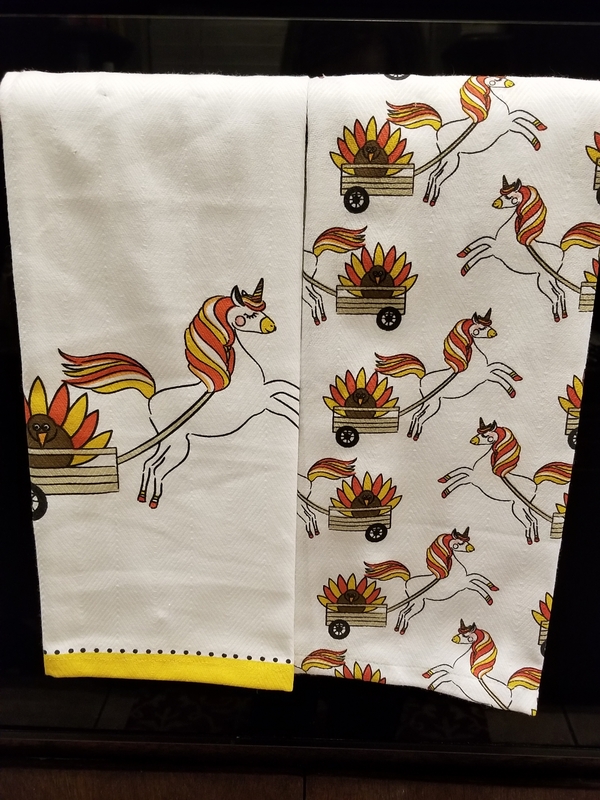 Those kitchen towels are quite cute! I hope that the brain funk clears soon and you have a better path forward! hank you!!! I appreciate it a lot!